Dr Samantha Letters, in the Gazetteer of Markets and Fairs in England and Wales to 1516, says that the reference is to a charter of Henry de Nunant, and to an earlier one of his father Roger. She dates it to before 1176-77, when Roger de Nunant died. Rot. Cart is Rotuli Chartarum, or Charter Rolls. In the National Archives? It seems likely to be linked to the document from the following year in the National Archives, 'Accounts of the profits of the market, Prideaux and Harris v. Ford and Others.' At least part of the dispute concerned the weighing of wool and yarn. A 'common beam', a device for weighing commodities such as wool, was often housed within market halls. It was a legal requirement to use this official measure, and its importance was such that tolls could be levied on its use. Goods could be forfeited if alternative beams were used. In the 22nd year of Charles II's reign a case was brought by a person called Yard against Ford. 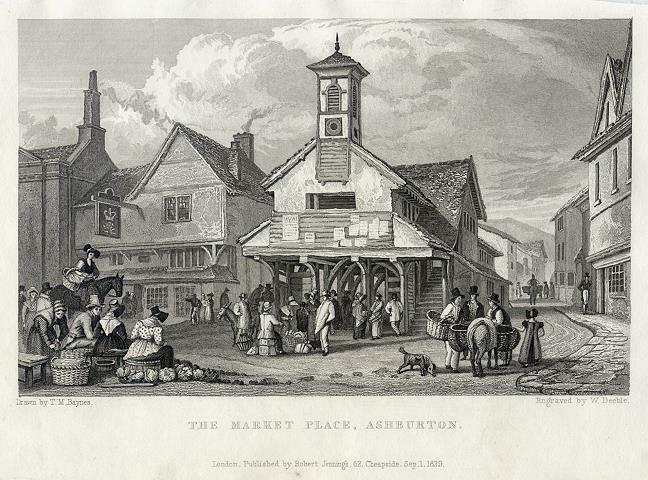 Yard claimed that Ford had 'without any lawful warrant or authority' set up a Tuesday market at Ashburton selling yarn and other merchandise, which was affecting his own Wednesday market at Newton Abbot. The plaintiff won the case, and was awarded £60 damages. In his will he left an annuity of £8 to be paid out of the market's profits to pay for poor children to learn to read the Bible. Andrew Quick, first elected member for the borough in 1712, procured for it two...fairs, on the first Tuesday in March and the first Thursday in June, and these fairs are still held upon those days. In 1842 Lurgecombe grist and flour mill was sold by Mr John Pearce, a selling point being that an 'excellent' corn market was held in Ashburton. In November 1845 the Western Times reported that potatoes were still in short supply. They were selling at 1s for 20lb at the weekly fair, double the price of the same week the previous year. Flour was 2s 4d for 12lb, compared to 1s 8d the previous year. Labourers' wages were unchanged - the newspaper demanded that 'things must change, and that soon'. 1848. James Foster, described as an elderly fish-dealer, was summoned for selling fish from a stall in East Street. Robert Bowden, one of the Surveyors of the Highways, had told him to stop the practice after complaints, but Foster ignored his warnings. The defendant said that he had sold fish there for 41 years. Mr S Mann, the 'market man', stated that the fish market had been near the Shambles since 'time immemorial'. He believed it had been the market place for 300 years. During the course of the case it was stated that the sheep and bullock market had also been held in the streets for as long as anyone could remember. The magistrates imposed costs of 14s 6d, and because these were heavy the fine was only 1s. Yolk wool 5d per lb*. * See The Mills section for more on yolk wool. Above and above right: Pencil drawings by Frederick Foot of the old market hall, just before its demolition. Left: The old Market Place, 1830s. Engraved by William Deeble after a picture by D M Haynes, and published in History of Devonshire, 1830. The building to the left of the market is the Rose and Crown, at the corner of West St and North St. If you stand at the Bull Ring and look up North St, the market would have been in the middle of the road. In 1849 a petition (called a 'memorial') was sent to Lord Clinton concerning the dangerous state of the market hall, presumed to be the oldest in the county. 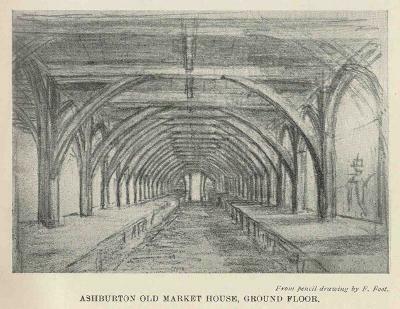 As the receiver of all the tolls of the market and fairs, the petitioners hoped that Lord Clinton would build a new market hall: one of their concerns was to have a place for the sale of fish, rather than have it sold in the open street as at present. 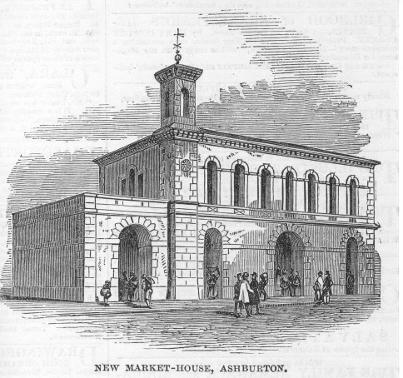 A new market hall, now called the Town Hall, was built by Lord Clinton in 1850. When the old shambles was demolished the materials were auctioned off. They included several elm trees and some fine old English oak, said to be over 500 years old. During the removal 'no coins of much antiquity' had been found. Mr John Tickell, of Ilsington, had the contract for supplying the granite. The three clock dials from the old market house were overhauled by Mr J Horson, and refitted in the tower of St Lawrence Chapel. Not everyone was happy with the new Town Hall. A correspondent to the Exeter and Plymouth Gazette in 1851 accused the new lessee of the market of enforcing arbitrary rules and tolls. No-one, it was alleged, was allowed to carry anything through the street, or display anything in a window, without paying such tolls. The March fair has a large supply of cattle, and the November fair is a great sheep mart. In June 1851 Cecil Torr's grandfather wrote to his father 'People say that Ashburton Fair is past, and the apples are safe' In other words, Torr explains, the danger of frost was over by the first Thursday in June. The market, an excellent one, is held on Saturday; and the fairs on the first Thursdays in March and June, the 10th of August and the 11th of November. There was panic in the autumn of 1854, as the price of corn rose steeply. Millers and bakers had low stocks, as they thought demand would slow after the harvest. Anybody holding corn was reluctant to sell. The Town Hall finally got a clock in 1871. It was made by J W Benson of Ludgate Hill and Old Bond Street, London, and featured large illuminated dials with cast-iron rims and blue enamelled figures. At night the dials were lit from behind with gas, so that 'the time can easily be seen from a great distance.' The movement, a dead beat escapement, was constructed of hammered brass revolving on steel pinions. The small additional cost of a striking mechanism would have made it perfect. The Market Hall, with the pannier, fish and corn market, was put up for sale in 1915. This came with the Lordship of the Manor. The bidding started at £500, and Mr H M Firth of the Knowle finally bought it for £1400. In June 1881 the Western Times reported on the midsummer fair at Newton. 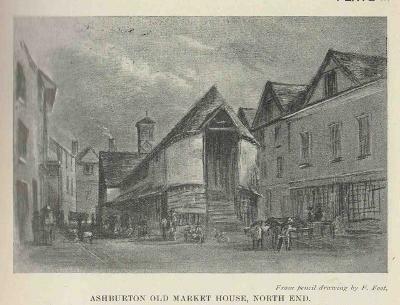 'An old friend, the whortle berry* woman from Ashburton, made her first appearance this season, and her well known voice resounded from one end of the street to the other.' She was charging 6d per quart. Above: The cattle market in North Street. Railings keep the animals off the pavements. With many thanks to Tereena Ravenscroft for this photograph. The May 1872 cattle market was the first being held with the benefit of the new railway line. In 1906 a special train was laid on to bring dealers to the March fair. With thanks to Dave Hodge-Brooks and Ernie Smerdon. 1907 It was proposed that a cattle market was built in Ladwell Orchard. There was some discussion at a meeting of the Urban District Council as to who should bear the costs of covering the stream that flowed through it. At the same meeting Mr J Fogden, hairdresser, had sent a 'very long letter' to the Urban District Council, enclosing a bill for taking preventative measures to stop cattle breaking his windows at a recent fair. The Council denied liability. 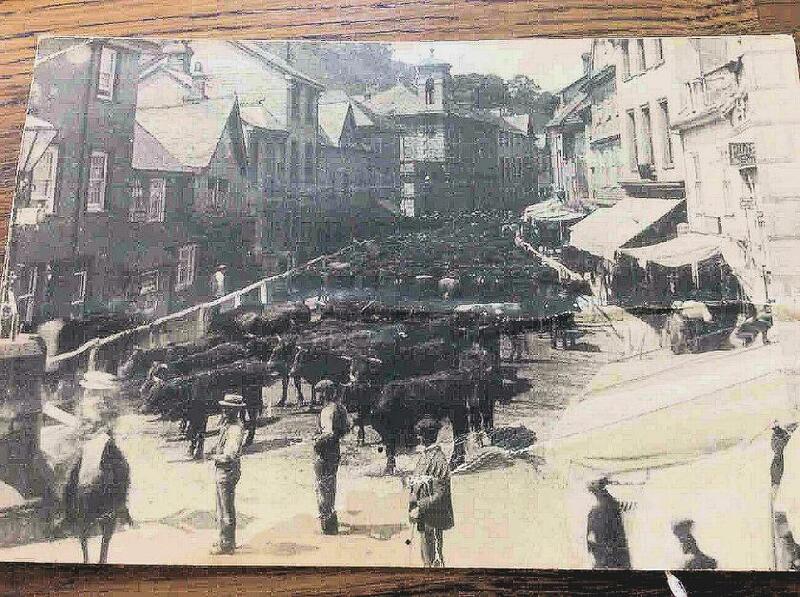 Cattle markets were held frequently, the animals brought in by drovers or farm labourers. The bleating of the sheep and the shouting of the men created havoc in the streets. Manure was often deposited in the street by the animals and keen gardeners would appear with a bucket and shovel to remove the deposit for enriching their soil - many people grew vegetables in their gardens, and took great pride in the size and quality of their produce. Public houses were open all day when the markets were held, but some men were TT*. The back of Mrs Mann's shop was partitioned off for farmers to use on Fair Days when they ate their pasties and drank tea. They sat on wooden forms having their meal and discussing the state of the economy as it affected them. This little enclosure with its bare table and forms provided a peaceful retreat from the noise of the animals and the shouts of the drovers. The railway station was busy as a goods train would arrive to transport many sheep and cows to what must have been for many their final destination. I hated Fair Days and was haunted by their pathetic cries as the animals were herded into pens and then trucks. When the last animals had been despatched, council workers came into action hosing down the streets. As one genteel lady remarked, 'So distasteful to the eye and nose !' Eventually all was quiet and normality returned. 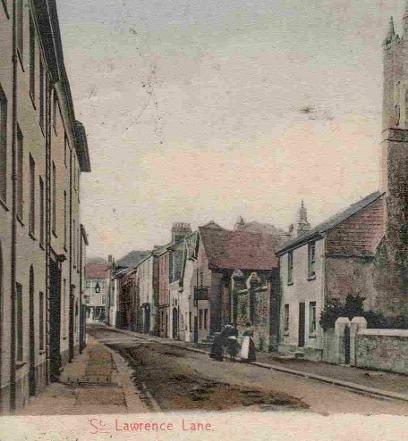 Left: Although coloured in, the above pre WW1 picture seems to show manure in the streets. See Hazel Bray's description above.